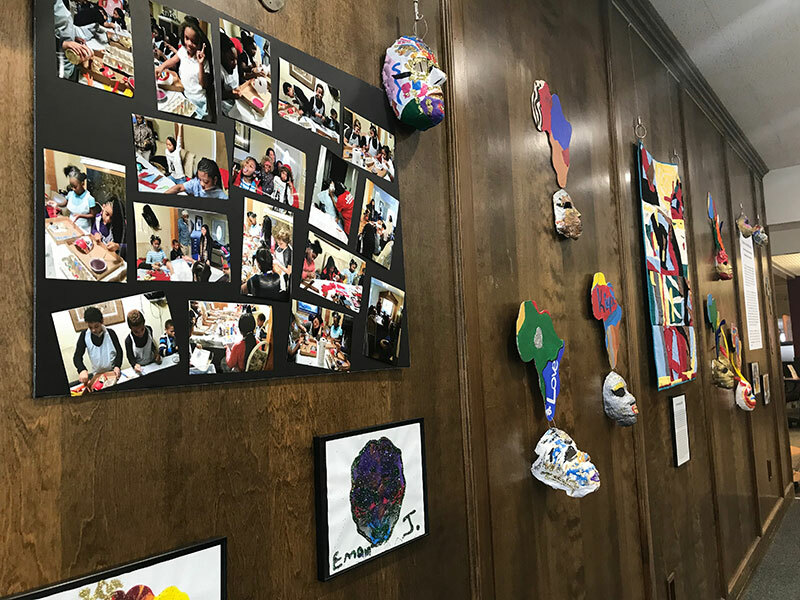 In celebration of Black History Month, a new Gumberg Library exhibit features African art created by fourth and fifth-grade students from the Center That CARES in the Hill District. CHAAT: Children’s Art and Talk Groups’ fourth annual art exhibit, which runs through Friday, Feb. 22, is located in the library’s fourth-floor Popular Reading Room. CHAAT provides culturally informed, art-based workshops to enhance after-school programming for children at the Center That CARES. Drawing from traditions of African and African-American mask making, quilt making and more, children have the opportunity to express themselves, build confidence and create a sense of identity. Led by Assistant Psychology Professor Dr. Jessie Goicoechea, her doctoral students and the Rita M. McGinley Psychology Clinic, CHAAT meets weekly at the Center That CARES to connect children in the Hill District with local African-American artists. The sessions also promote artistic expression and mental wellbeing. The CHAAT art exhibit is presented by the Rita M. McGinley Psychology Clinic, the Department of Psychology and Gumberg Library. Contact Goicoechea at goicoecheaj@duq.edu with questions.